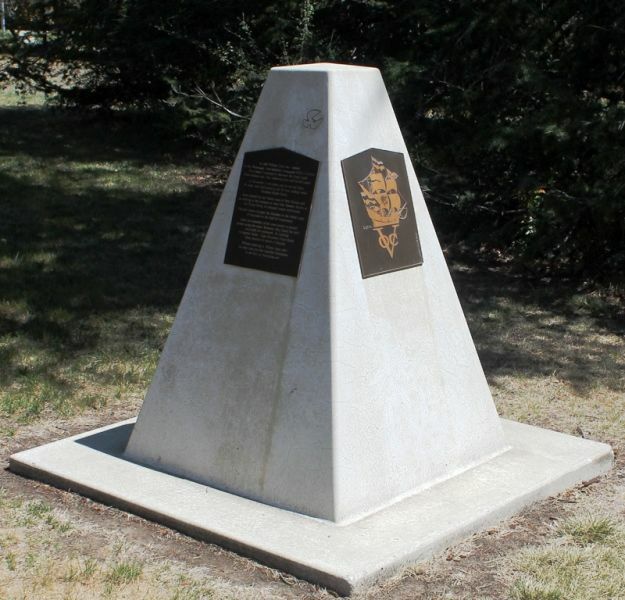 A monument commemorates the expedition led by Willem Jansz to explore New Guinea and Australia in 1605. Willem Janssen (1603-1628), was a mariner from Amsterdam, and he received at least enough education to enable him to write and to become expert in navigation. 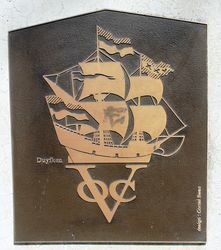 In December 1603, he sailed from Holland for the East as skipper of the small yacht Duyfken in the fleet of van der Hagen. 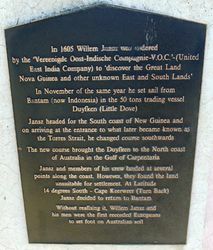 In 1605-06 he took part as her skipper in the first discovery of any part of the Australian coastline when he examined the east coast of the Gulf of Carpentaria from 11°S to 14°S. On his return from that expedition he was desultorily employed as a skipper for several years and served for a time in the squadron commanded by Jan Roossengin. In January 1611 he was appointed an upper-merchant and sailed for home in that grade. He returned to the East in November 1612 and served in Moluccan waters as an upper-merchant and for a time as governor or commandeur of Fort Henricus on Solor. At the end of 1616 he again went home as upper-merchant and in July 1617 took his discharge. In August he re-enlisted in his former grade but with the promise of early employment as a vice-governor or commandeur at sea. In January 1618 he set out in the Mauritius for Java, and on 31 July called at Cloates Land, which he reported as a new discovery, being ignorant of Mibaise's earlier sighting of it. 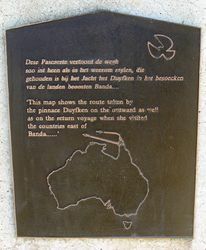 His landing party saw, near North-West Cape, footprints and smoke signals: the earliest evidence that Eendracht's Land was inhabited. 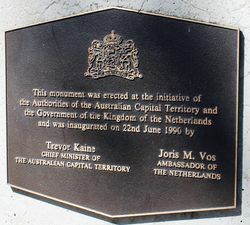 On reaching Jacatra he was called into consultation by the governor-general and in March 1619 was appointed to the Council of the Indies. He took part in the operations in which Coen relieved the fort and destroyed the town of Jacatra, and soon afterwards sailed to Tiku where he captured four ships of the English East India Co., which had aided the Javanese. For his part in this he was decorated with a chain of honour.